Here’s another cool, holiday reminder post: Remember that offer we ran for a free Chilis gift card during the middle of November? I just want to remind all of your that the offer ends this Christmas Eve, or December 24th. If you need some last minute stocking stuffers for loved ones, why not sign up for some free Chili’s gift cards? You can celebrate the holiday season and bring in the new year with these delicious meals from Chili’s. You’ll receive a free $10 gift card after purchasing a $50 gift card. Chili’s is running this awesome deal right now on their gift cards. 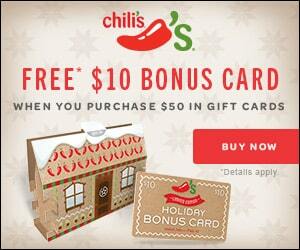 When you purchase a $50 gift card from Chilis, you will receive a free Chilis gift card worth $10. Chilis gift cards make wonderful presents for the holidays. Why not buy the expensive one as a gift for a loved one and save the other for yourself? The deal ends this upcoming December 24th. So, take advantage of the deal for this holiday season.